TACOMA, Wash. - Tacoma Rainiers Team President Aaron Artman and Seattle Mariners Director of Player Development Andy McKay today announced a four-year extension of their Player Development Contract that will run through the 2022 Pacific Coast League season. The partnership between Tacoma and Seattle has been in place since 1995, making their affiliation one of the strongest and longest-lasting affiliate relationships in baseball. 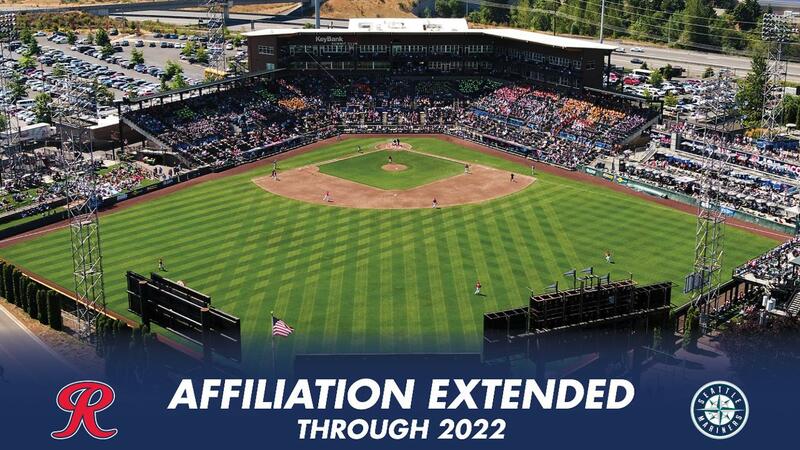 The Rainiers 2019 season will be the 25th year as the Mariners top minor league affiliate - during that span Tacoma has posted an all-time record of 1,741-1,690 (.507). "This has always been a great relationship," Tacoma Rainiers owner Mikal Thomsen said. "Our fans in Tacoma and I are all Mariners fans, so it is a natural thing to follow players on both teams from the fan standpoint. On the business side, the Mariners - to a person and as an organization - have been great to work with, and we look forward to maintaining this affiliation far into the future." Since joining the Seattle organization, Tacoma has collected five division titles, three conference championships, and two Pacific Coast League Championships (2001, 2010). Rainiers players and field staff have also accumulated numerous awards over the course of the affiliation, including 47 mid-season all-star selections, one PCL Pitcher of the Year, two PCL Rookies of the Year, three PCL Mangers of the Year, five league ERA champions, and one league strikeout champion. "The Mariners are excited to be able to extend our relationship with the Rainiers," McKay said. "The Rainiers have consistently demonstrated their commitment to providing the best possible environment for our prospects to develop, as well as providing an opportunity for baseball fans in the Pacific Northwest to meet the next generation of Mariners." The Mariners current 38-man active roster features 22 players who have spent time with the Rainiers, including 17 who saw the Cheney Stadium field during the 2018 season. Since 1995, numerous future Seattle stars came through Tacoma before beginning their Major League careers in earnest including Felix Hernandez, Kyle Seager, James Paxton, Mike Zunino, Freddy Garcia, and Alex Rodriguez. "Being Seattle's Triple-A affiliate makes sense for this franchise on so many levels," Artman said. "We are thrilled to extend this partnership with the Mariners, and look forward to showcasing their top prospects at Cheney Stadium for years to come." Since the renovation of Cheney Stadium in 2011, the Tacoma Rainiers have made numerous investments to improve the fan experience and baseball development facilities at the ballpark. These capital projects and upgrades have helped shape Cheney Stadium into one of the premier destinations in the country for grooming Major League talent. "The relationship between the Mariners and the Rainiers has been a staple of baseball in the Pacific Northwest since 1995," Mariners Executive Vice President & General Manager Jerry Dipoto said. "While we are two franchises, we remain one baseball family and couldn't be more thankful for our terrific partners in Tacoma. We fully believe this is simply the next chapter in what will soon be a quarter century of tradition." To learn more about 2019 season ticket options, party deck and suite options, or group ticket options, please email tickets@wertacoma.com or call 253-752-7707. The most up-to-date news and notes about the Tacoma Rainiers leading up to the 2019 season can be found by following the club on Twitter (@RainiersLand) and liking the team on Facebook.